Folic acid (also known as vitamin M, vitamin B9, vitamin Bc (or folacin), pteroyl-L-glutamic acid) is a form of the water-soluble vitamin B9. Folate is a naturally occurring form of the vitamin, found in food, while folic acid is synthetically produced, and used in fortified foods and supplements. Folic acid is itself not biologically active, but its biological importance is due to tetrahydrofolate and other derivatives after its conversion to dihydrofolic acid in the liver. Vitamin B9 (folic acid and folate) is essential for numerous bodily functions. Humans cannot synthesize folate de novo; therefore, folate has to be supplied through the diet to meet their daily requirements. The human body needs folate to synthesize DNA, repair DNA, and methylate DNA as well as to act as a cofactor in certain biological reactions. It is especially important in aiding rapid cell division and growth, such as in infancy and pregnancy. Children and adults both require folic acid to produce healthy red blood cells and prevent anemia. Folate and folic acid derive their names from the Latin word folium, which means "leaf". Folate occurs naturally in many foods, and among plants are especially plentiful in dark green leafy vegetables. A lack of dietary folates can lead to folate deficiency. A complete lack of dietary folate takes months before deficiency develops as normal individuals have about 500–20,000 µg of folate in body stores. This deficiency can result in many health problems, the most notable one being neural tube defects in developing embryos. Common symptoms of folate deficiency include diarrhea, macrocytic anemia with weakness or shortness of breath, nerve damage with weakness and limb numbness (peripheral neuropathy), pregnancy complications, mental confusion, forgetfulness or other cognitive declines, mental depression, sore or swollen tongue, peptic or mouth ulcers, headaches, heart palpitations, irritability, and behavioral disorders. Low levels of folate can also lead to homocysteine accumulation. DNA synthesis and repair are impaired and this could lead to cancer development. Adequate folate intake during the preconception period (which is the time right before and just after a woman becomes pregnant) helps protect against a number of congenital malformations, including neural tube defects (which are the most notable birth defects that occur from folate deficiency). Neural tube defects are severe abnormalities of the central nervous system that develop in babies during the first few weeks of pregnancy resulting in malformations of the spine, skull, and brain; the most common neural tube defects are spina bifida and anencephaly. The risk of neural tube defects is significantly reduced when supplemental folic acid is consumed in addition to a healthy diet before conception and during the first month after conception. Supplementation with folic acid has also been shown to reduce the risk of congenital heart defects, cleft lips, limb defects, and urinary tract anomalies. Folate deficiency during pregnancy may also increase the risk of preterm delivery, infant low birth weight and fetal growth retardation, as well as increasing homocysteine level in the blood, which may lead to spontaneous abortion and pregnancy complications, such as placental abruption and pre-eclampsia. Women who could become pregnant are advised to eat foods fortified with folic acid or take supplements in addition to eating folate-rich foods to reduce the risk of serious birth defects. Taking 400 micrograms of synthetic folic acid daily from fortified foods and/or supplements has been suggested for all non-pregnant women, in order to have adequate folic acid intake even in case of unplanned pregnancies. The RDA for folate equivalents for pregnant women is set at 600 micrograms, although a range of 400 micrograms up to 4 milligrams (4000 micrograms) reported in an old U.S. Public Health Service guideline is still followed by many health care providers. The mechanisms and reasons why folic acid prevents birth defects is unknown. It is hypothesized that the insulin-like growth factor 2 gene is differentially methylated and these changes in IGF2 result in improved intrauterine growth and development. Approximately 85% of women in an urban Irish study reported using folic acid supplements before they become pregnant, but only 18% used enough folic acid supplements to meet the current folic acid requirements due, it is reported, to socio-economic challenges. Folic acid supplements may also protect the fetus against disease when the mother is battling a disease or taking medications or smoking during pregnancy. It also contributes to oocyte maturation, implantation, placentation, in addition to the general effects of folic acid and pregnancy. Therefore, it is necessary to receive sufficient amounts through the diet to avoid subfertility. There is growing concern worldwide that prenatal high folic acid in the presence of low vitamin B12 causes epigenetic changes in the unborn predisposing them to metabolic syndromes, central adiposity and adult diseases such as Type 2 diabetes. Another active area of research and concern is that either too much or too little folic acid in utero causes epigenetic changes to the brain leading to autism spectrum disorders. Folate is necessary for fertility in both men and women. It contributes to spermatogenesis. Therefore, it is necessary to receive sufficient amounts through the diet to avoid subfertility. Also, polymorphisms in genes of enzymes involved in folate metabolism could be one reason for fertility complications in some women with unexplained infertility. Taking folic acid does not reduce cardiovascular disease even though it reduces homocysteine levels. Folic acid supplements consumed before and during pregnancy may reduce the risk of heart defects in infants. Folic acid appears to reduce the risk of stroke, which may be due to the role folate plays in regulating homocysteine concentration. The reviews indicate the risk of stroke appears to be reduced only in some individuals, but a definite recommendation regarding supplementation beyond the current RDA has not been established for stroke prevention. Observed stroke reduction is consistent with the reduction in pulse pressure produced by folate supplementation of 5 mg per day, since hypertension is a key risk factor for stroke. Folic supplements are inexpensive and relatively safe to use, which is why stroke or hyperhomocysteinemia patients are encouraged to consume daily B vitamins including folic acid. Folic acid supplementation does not appear to affect the rate of cancer. Diets high in folate are associated with decreased risk of colorectal cancer; some studies show the association is stronger for folate from foods alone than for folate from foods and supplements, One broad cancer screening trial reported a potential harmful effect of too much folate intake on breast cancer risk, suggesting routine folate supplementation should not be recommended as a breast cancer preventive. Most research studies associate high dietary folate intake with a reduced risk of prostate cancer. Folate is important for cells and tissues that rapidly divide. Cancer cells divide rapidly, and drugs that interfere with folate metabolism are used to treat cancer. The antifolate methotrexate is a drug often used to treat cancer because it inhibits the production of the active form of THF from the inactive dihydrofolate (DHF). However, methotrexate can be toxic, producing side effects, such as inflammation in the digestive tract that make it difficult to eat normally. Also, bone marrow depression (inducing leukopenia and thrombocytopenia), and acute renal and hepatic failure have been reported. Folinic acid, under the drug name leucovorin, a form of folate (formyl-THF), can help "rescue" or reverse the toxic effects of methotrexate. Folinic acid is not the same as folic acid. Folic acid supplements have little established role in cancer chemotherapy. There have been cases of severe adverse effects of accidental substitution of folic acid for folinic acid in patients receiving methotrexate cancer chemotherapy. It is important for anyone receiving methotrexate to follow medical advice on the use of folic or folinic acid supplements. The supplement of folinic acid in patients undergoing methotrexate treatment is to give cells dividing less rapidly enough folate to maintain normal cell functions. The amount of folate given will be depleted by rapidly dividing cells (cancer) very fast and so will not negate the effects of methotrexate. Some evidence links a shortage of folate with depression. Limited evidence from randomised controlled trials showed using folic acid in addition to antidepressants, to be specific SSRIs, may have benefits. Research at the University of York and Hull York Medical School has found a link between depression and low levels of folate. One study by the same team involved 15,315 subjects. However, the evidence is probably too limited at present for this to be a routine treatment recommendation. [according to whom?] Folic acid supplementation affects noradrenaline and serotonin receptors within the brain, which could be the cause of folic acid's possible ability to act as an antidepressant. The exact mechanisms involved in the development of schizophrenia are not entirely clear, but may have something to do with DNA methylation and one carbon metabolism, and these are the precise roles of folate in the body. A substudy of the Women's Antioxidant and Folic Acid Cardiovascular Study published in 2009 reported use of a nutritional supplement containing folic acid, pyridoxine, and cyanocobalamin decreased the risk of developing age-related macular degeneration by 34.7%. There is a complex interaction between folic acid, vitamin B12 and iron. A deficiency of one may be "masked" by excess of another so the three must be in balance. The risk of toxicity from folic acid is low, because folate is a water-soluble vitamin and is regularly removed from the body through urine. One potential issue associated with high dosages of folic acid is that it has a masking effect on the diagnosis of pernicious anaemia (vitamin B12 deficiency), and a variety of concerns of potential negative impacts on health. Folate deficiency may lead to glossitis, diarrhea, depression, confusion, anemia, and fetal neural tube defects and brain defects (during pregnancy). Folate deficiency is accelerated by alcohol consumption. 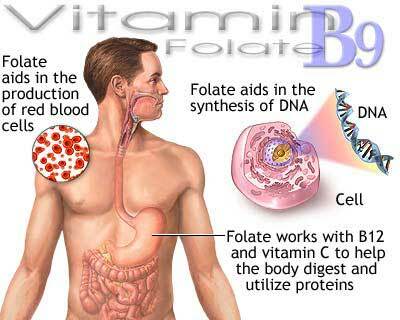 Folate deficiency is diagnosed by analyzing CBC and plasma vitamin B12 and folate levels. CBC may indicate megaloblastic anemia but this could also be a sign of vitamin B12 deficiency. A serum folate of 3 μg/L or lower indicates deficiency. Serum folate level reflects folate status but erythrocyte folate level better reflects tissue stores after intake. An erythrocyte folate level of 140 μg/L or lower indicates inadequate folate status. Increased homocysteine level suggests tissue folate deficiency but homocysteine is also affected by vitamin B12 and vitamin B6, renal function, and genetics. One way to differentiate between folate deficiency from vitamin B12 deficiency is by testing for methylmalonic acid levels. Normal MMA levels indicate folate deficiency and elevated MMA levels indicate vitamin B12 deficiency. Folate deficiency is treated with supplemental oral folate of 400 to 1000 μg per day. This treatment is very successful in replenishing tissues, even if deficiency was caused by malabsorption. Patients with megaloblastic anemia need to be tested for vitamin B12 deficiency before folate treatment, because if the patient has vitamin B12 deficiency, folate supplementation can remove the anemia, but can also worsen neurologic problems. Morbidly obese patients with BMIs of greater than 50 are more likely to develop folate deficiency. Patients with celiac disease have a higher chance of developing folate deficiency. Cobalamin deficiency may lead to folate deficiency, which, in turn, increases homocysteine levels and may result in the development of cardiovascular disease or birth defects. Some studies show iron-folic acid supplementation in children under 5 may result in increased mortality due to malaria; this has prompted the World Health Organization to alter their iron-folic acid supplementation policies for children in malaria-prone areas, such as India. Folate naturally occurs in a wide variety of foods, including vegetables (particularly dark green leafy vegetables), fruits and fruit juices, nuts, beans, peas, dairy products, poultry and meat, eggs, seafood, grains, and some beers. Spinach, liver, yeast, asparagus, and Brussels sprouts are among the foods with the highest levels of folate. Folic acid is added to grain products in many countries, and in these countries, fortified products make up a significant source of the population's folic acid intake. Because of the difference in bioavailability between supplemented folic acid and the different forms of folate found in food, the dietary folate equivalent (DFE) system was established. 1 DFE is defined as 1 μg of dietary folate, or 0.6 μg of folic acid supplement. This is reduced to 0.5 μg of folic acid if the supplement is taken on an empty stomach. Folate naturally found in food is susceptible to high heat and ultraviolet light, and is soluble in water. 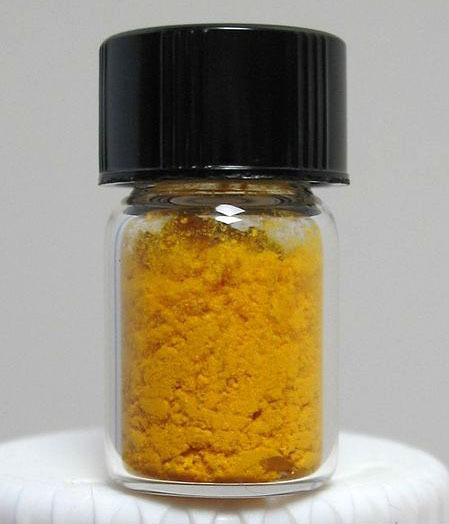 It is heat-labile in acidic environments and may also be subject to oxidation. Some meal replacement products do not meet the folate requirements as specified by the RDAs. Folate (B9) can also be processed from the pro-vitamin Pteroylmonoglutamic acid (Vitamin B10). In the 1920s, scientists believed folate deficiency and anemia were the same condition. A key observation by researcher Lucy Wills in 1931 led to the identification of folate as the nutrient needed to prevent anemia during pregnancy. Dr. Wills demonstrated anemia could be reversed with brewer's yeast. Folate was identified as the corrective substance in brewer's yeast in the late 1930s, and was first isolated in and extracted from spinach leaves by Mitchell and others in 1941. Bob Stokstad isolated the pure crystalline form in 1943, and was able to determine its chemical structure while working at the Lederle Laboratories of the American Cyanamid Company. This historical research project, of obtaining folic acid in a pure crystalline form in 1945, was done by the team called the "folic acid boys," under the supervision and guidance of Director of Research Dr. Yellapragada Subbarao, at the Lederle Lab, Pearl River, NY. This research subsequently led to the synthesis of the antifolate aminopterin, the first-ever anticancer drug, the clinical efficacy was proven by Sidney Farber in 1948. In the 1950s and 1960s, scientists began to discover the biochemical mechanisms of action for folate. In 1960, experts first linked folate deficiency to neural tube defects. In the late 1990s, US scientists realized, despite the availability of folate in foods and in supplements, there was still a challenge for people to meet their daily folate requirements, which is when the US implemented the folate fortification program. Folate is necessary for the production and maintenance of new cells, for DNA synthesis and RNA synthesis, and for preventing changes to DNA, and, thus, for preventing cancer. It is especially important during periods of frequent cell division and growth, such as infancy and pregnancy. Folate is needed to carry one-carbon groups for methylation reactions and nucleic acid synthesis (the most notable one being thymine, but also purine bases). Thus, folate deficiency hinders DNA synthesis and cell division, affecting hematopoietic cells and neoplasms the most because of their greater frequency of cell division. RNA transcription, and subsequent protein synthesis, are less affected by folate deficiency, as the mRNA can be recycled and used again (as opposed to DNA synthesis, where a new genomic copy must be created). Since folate deficiency limits cell division, erythropoiesis, production of red blood cells, is hindered and leads to megaloblastic anemia, which is characterized by large immature red blood cells. This pathology results from persistently thwarted attempts at normal DNA replication, DNA repair, and cell division, and produces abnormally large red cells called megaloblasts (and hypersegmented neutrophils) with abundant cytoplasm capable of RNA and protein synthesis, but with clumping and fragmentation of nuclear chromatin. Some of these large cells, although immature (reticulocytes), are released early from the marrow in an attempt to compensate for the anemia. Both adults and children need folate to make normal red and white blood cells and prevent anemia. Deficiency of folate in pregnant women has been implicated in neural tube defects (NTD); therefore, many developed countries have implemented mandatory folic acid fortification in cereals, etc. NTDs occur early in pregnancy (first month), therefore women must have abundant folate upon conception. Folate is required to make red blood cells and white blood cells and folate deficiency may lead to anemia, which further leads to fatigue and weakness and inability to concentrate. In the form of a series of tetrahydrofolate (THF) compounds, folate derivatives are substrates in a number of single-carbon-transfer reactions, and also are involved in the synthesis of dTMP (2′-deoxythymidine-5′-phosphate) from dUMP (2′-deoxyuridine-5′-phosphate). It is a substrate for an important reaction that involves vitamin B12 and it is necessary for the synthesis of DNA, and so required for all dividing cells. The pathway leading to the formation of tetrahydrofolate (FH4) begins when folic acid (F) is reduced to dihydrofolate (DHF) (FH2), which is then reduced to THF. Dihydrofolate reductase catalyses the last step. Vitamin B3 in the form of NADPH is a necessary cofactor for both steps of the synthesis. Thus, hydride molecules are transferred from NADPH to the C6 position of the pteridine ring to reduce folic acid to THF. Methylene-THF (CH2FH4) is formed from THF by the addition of a methylene bridge from one of three carbon donors: formate, serine, or glycine. Methyl tetrahydrofolate (CH3-THF, or methyl-THF) can be made from methylene-THF by reduction of the methylene group with NADPH. Another form of THF, 10-formyl-THF, results from oxidation of methylene-THF or is formed from formate donating formyl group to THF. Also, histidine can donate a single carbon to THF to form methenyl-THF. Vitamin B12 is the only acceptor of methyl-THF, and this reaction produces methyl-B12 (methylcobalamin). There is also only one acceptor for methyl-B12, homocysteine, in a reaction catalyzed by homocysteine methyltransferase. These reactions are of importance because a defect in homocysteine methyltransferase or a deficiency of B12 may lead to a so-called "methyl-trap" of THF, in which THF is converted to a reservoir of methyl-THF which thereafter has no way of being metabolized, and serves as a sink of THF that causes a subsequent deficiency in folate. Thus, a deficiency in B12 can generate a large pool of methyl-THF that is unable to undergo reactions and will mimic folate deficiency. All the biological functions of folic acid are performed by tetrahydrofolate and other derivatives. Their biological availability to the body depends upon dihydrofolate reductase action in the liver. This action is unusually slow in humans, being less than 2% of that in rats. Moreover, in contrast to rats, an almost-5-fold variation in the activity of this enzyme exists between humans. Due to this low activity, it has been suggested this limits the conversion of folic acid into its biologically active forms "when folic acid is consumed at levels higher than the Tolerable Upper Intake Level (1 mg/d for adults)." A number of drugs interfere with the biosynthesis of folic acid and THF. Among them are the dihydrofolate reductase inhibitors such as trimethoprim, pyrimethamine, and methotrexate; the sulfonamides (competitive inhibitors of 4-aminobenzoic acid in the reactions of dihydropteroate synthetase). Valproic acid, one of the most commonly prescribed anticonvulsants that is also used to treat certain psychological conditions, is a known inhibitor of folic acid, and as such, has been shown to cause neural tube defects and cases of spina bifida and cognitive impairment in the newborn. Because of this considerable risk, those mothers who must continue to use valproic acid or its derivatives during pregnancy to control their condition (as opposed to stopping the drug or switching to another drug or to a lesser dose) should take folic acid supplements under the direction and guidance of their health care providers. The National Health and Nutrition Examination Survey (NHANES III 1988–91) and the Continuing Survey of Food Intakes by Individuals (1994–96 CSFII) indicated most adults did not consume adequate folate. However, the folic acid fortification program in the United States has increased folic acid content of commonly eaten foods such as cereals and grains, and as a result, diets of most adults now provide recommended amounts of folate equivalents. 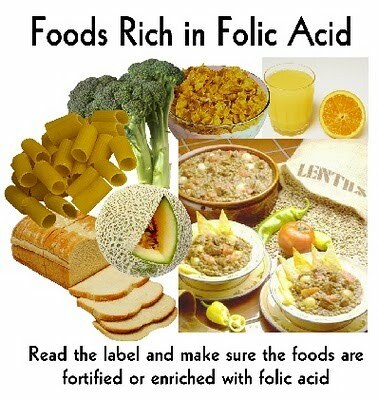 In the USA many grain products are fortified with folic acid. Folic acid fortification is a process where folic acid is added to flour with the intention of promoting public health through increasing blood folate levels in the populace. In the USA, food is fortified with folic acid, only one of the many naturally-occurring forms of folate, and a substance contributing only a minor amount to the folates in natural foods. Since the discovery of the link between insufficient folic acid and neural tube defects, governments and health organizations worldwide have made recommendations concerning folic acid supplementation for women intending to become pregnant. Fortification is controversial, with issues having been raised concerning individual liberty, as well as the health concerns described in the Toxicity section above. In the USA, there is concern that the federal government mandates fortification, but does not provide monitoring of potential undesirable effects of fortification.